It's been awhile since I had not made a wall of Vampire Knight, I missed it! I used this scan: http://gallery.minitokyo.net/download/494649 Although it's small, I could make the vector without too much difficulty. I worked on it since 20-25 hours, and tried new effects on hair, sweeter (I hope you'll like). I wanted to make a warm Bg and chose add a boof on my vector of Yuuki and Kaname and make a house library, like she was reading a book before he falls asleep. So cute! I finally worked more than usual lightning and shadows (I hope no doing mistake...). I wanted to create a warm, sweet and calm scene (as if I prefer Zero). I hope you'll like it! GREAT WORK. I LIKE IT . 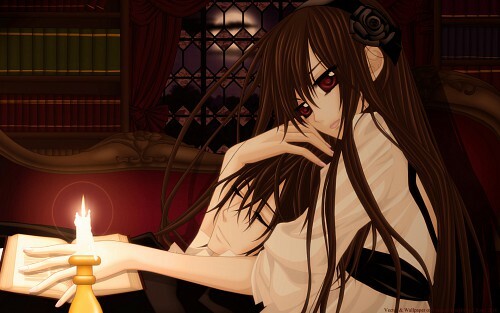 >_< VAMPIRE KNIGHT IS A COOL ANIME. Cilou you need to give me your secret on how to make such beautiful walls this fast ! Beautiful! Great job! I love your work, the background is amazing. This is a beautiful wallpaper, I love very much this couple, as always your works are excellent, you really have a lot of talent. this is a beutiful wallpaper. I love your work, as always, especially your Vampire Knight walls. The background is very well done. Yuki's lips look at little weird to me though. I really like the candle and Kaname's pose and expression here are just beautiful. Keep up the awesome work! Wow! So beautiful! I love the idea of Yuuki reading a book while Kaname falls asleep in her lap much better. Thank you for sharing! All of your art is so good... Thanks for sharing. I think this wallpaper had some good ideas, but it could have been much better. The people and especially the bookshelf are very flat. Frankly, I find the bookshelf painful to look at. Also, I appreciate you trying new things with the shadows, but it looks like you just made a copy of Yuki and moved it over, and as a result the shadows appear very unnatural. I believe you have the potential to do very well if you would just spend more time and effort on each of your wallpapers. OMG!THANKS! I waited for this picure in wallpaper version so much! totemo itoshikute, shiawase ni natte hoshii hutari desu. aa qe liinda se mira con kanamee ! This pic is very sweet and comforting. Lovely scan of Vampire knight, love this one. Thanks for making and sharing! You really did a great job!